This is a big week ahead. My mom is coming to town this weekend, my birthday is next week, my baby’s ONE YEAR birthday (!) 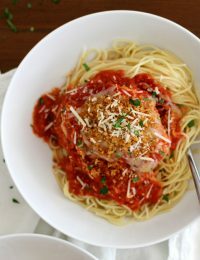 is the day after that, I’m going to see Death Cab for Cutie in concert for the first time ever, which is a total bucket list thing for me, AND I’ll be diving into this slow cooker chicken parmesan for dinner probably no less than three nights in a row, which is also a total bucket list thing for me. I am so excited about all of it. 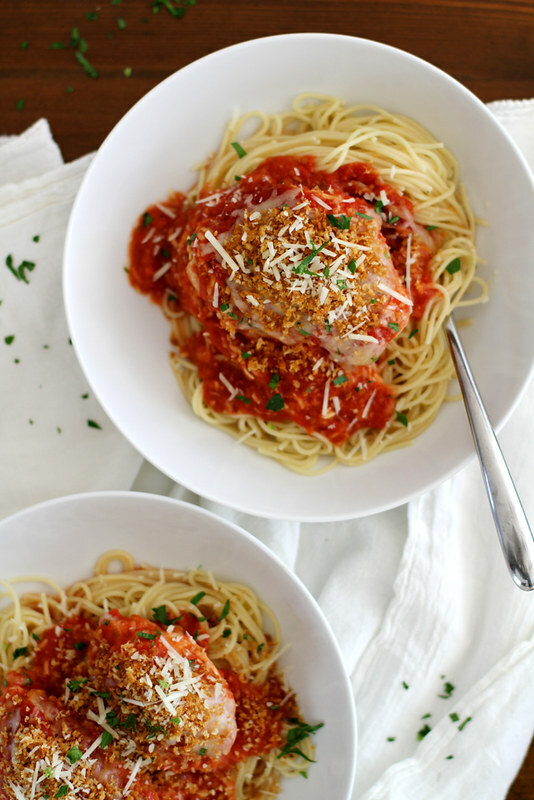 What, you don’t have this slow cooker chicken parmesan on your bucket list, too? Well, you should. Because it’s so easy and so tasty and so cheesy and so flavorful and actually, make that four nights in a row that I’ll be having this for dinner. With leftovers for lunch the next day. This slow cooker chicken parmesan situation was actually my husband’s idea, and it was brilliant. 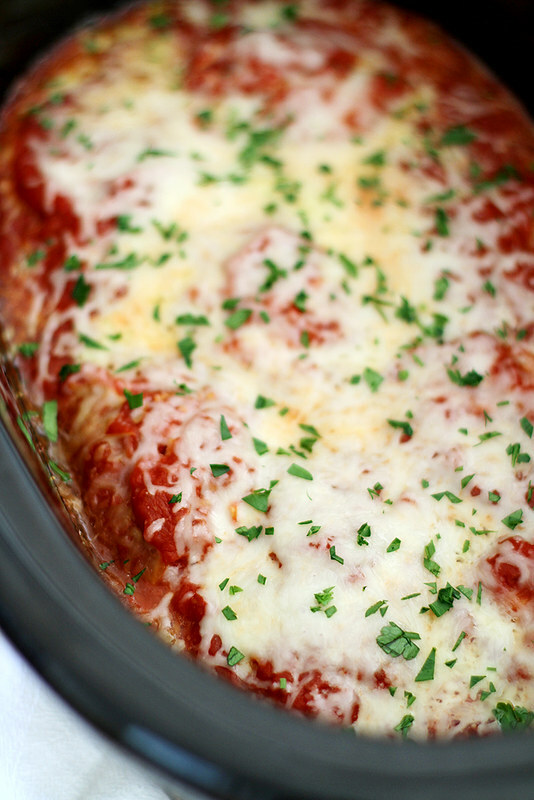 Because while I know the slow cooker is a gem of a kitchen appliance, what I didn’t know at the time was that it can make the most tender, most flavorful, most cheesy and hearty and yummy yum yums of a chicken parmesan. 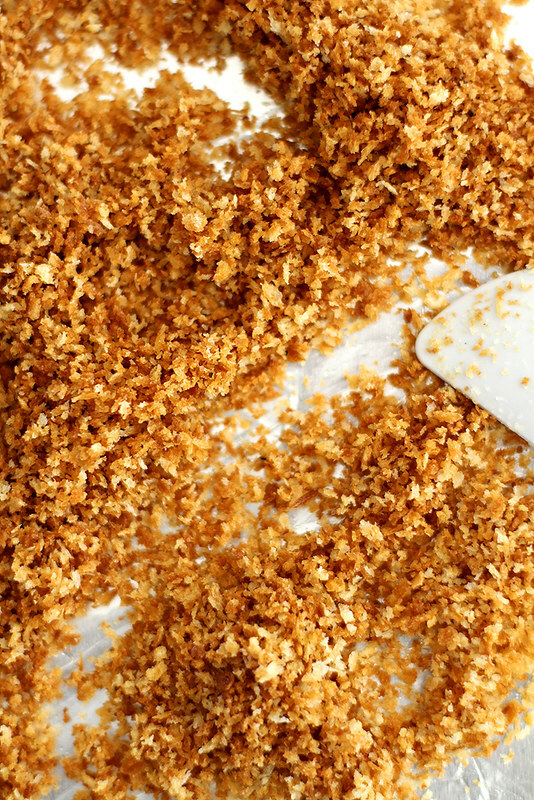 And you don’t even have to sacrifice the crispy, buttery breadcrumb topping! You sprinkle it on top after everything is cooked along with some extra cheese (of course) and every forkful is accompanied by a choir of angels singing the “Hallelujah” chorus. At least that was the case for me. The trick to getting the most flavorful/juicy/tender chicken is to use chicken thighs for the recipe. I know many of us are more chicken breast fans, including yours truly, but oftentimes in slow cooker recipes I’ve found they turn out dry and a little bland. So I turn to my new chicken friend, the boneless, skinless chicken thigh, for better results. Trust, when you give it a try you will quickly agree. I also suggest using the highest quality brand of crushed tomatoes you can find in your grocery store, because that tomato flavor goes a long way in this recipe and the last thing you want is some humdrum variation that leaves a lot to be desired in the taste department. What I love most about this recipe, in addition to the juicy chicken and all that cheeeeeese, is how the crushed tomatoes cook down into this velvety, slightly sweet and aromatic caramelized sauce around the other ingredients. I dare you not to sneak a spoonful or six before serving the rest of the dish to everyone else. But that’s your right as the cook of this chicken dinner, amiright? No one has to know that instead of slaving away over a hot stove all day to make it, you combined some ingredients in a slow cooker, turned it on, walked away and called it a day. 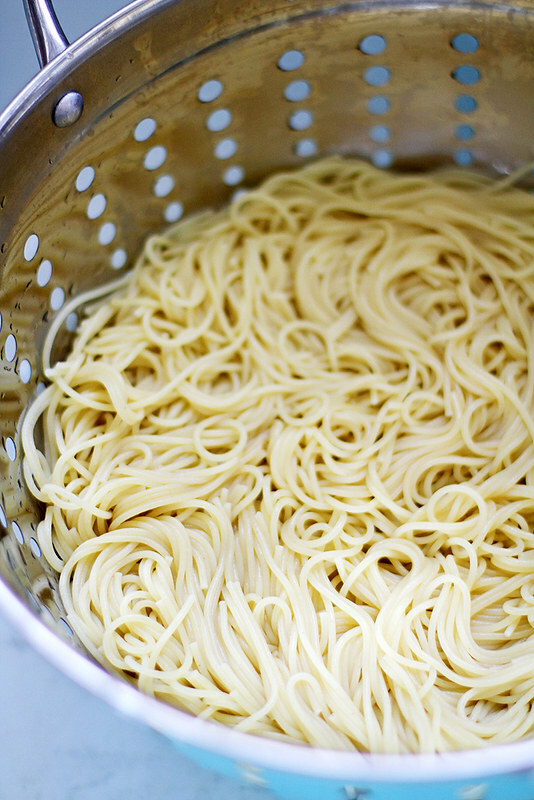 Maybe made some pasta in like two seconds while sipping on a glass of wine, too. In any case, be prepared for a lot of excitement from the dinner table over this dish. I bet they’ll even feel the same way the fourth day in a row you serve it. Have you ever seen a lovelier sight? I think not. P.S. What other slow cooker recipes do you know and love? I need more for my bucket list. In a large (6 qt) slow cooker, pour and spread just enough crushed tomatoes to cover bottom of slow cooker. Sprinkle with salt, to taste. Place chicken thighs in an even layer in slow cooker. Sprinkle with more salt and pepper. Sprinkle with 1/2 cup mozzarella cheese and 1/4 cup Parmesan cheese. Pour remaining crushed tomatoes evenly over top. Cover slow cooker and cook on low 6 to 7 hours or high 3 to 4 hours, until an instant-read thermometer inserted in chicken thighs reads 180 degrees F.
Meanwhile, heat broiler and line a baking sheet with foil. In a small bowl, combine panko breadcrumbs with butter and a pinch of salt and pepper. Spread in a thin, even layer on foil-lined baking sheet. Broil 3 to 5 minutes, stirring occasionally, until breadcrumbs are evenly golden brown. When chicken is cooked through, sprinkle remaining mozzarella cheese over top. 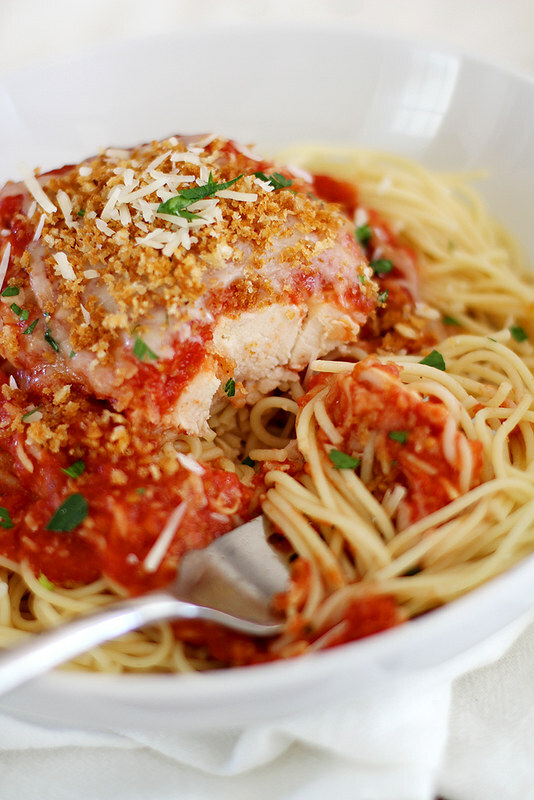 Serve in bowls over pasta, if desired, topping chicken with breadcrumbs and remaining Parmesan cheese. 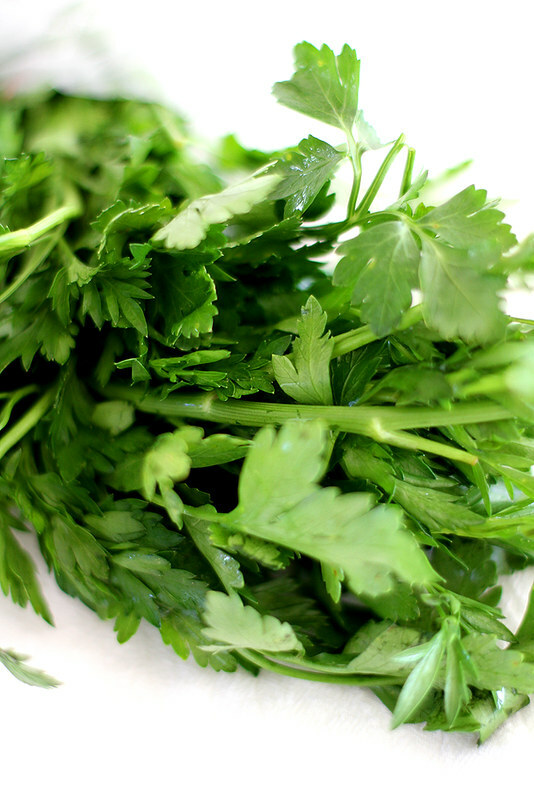 Garnish with parsley, if desired. So many good things happening all at once!! I love it. Have so much fun on your birthday AND the babe’s birthday AND with your mom AND at the concert AND chowing down on this parm! I have not seen a more lovely sight! This is beautiful, I can’t believe it came out of the slow-cooker! I actually adore chicken thighs, especially in the slow-cooker, so that makes me love this even more. Throwing the breadcrumbs on at the very end is brilliant. Now this is 100% on my bucket list as well! SO jealous of the DCFC concert!! Also jealous of this dinner – it looks delicious! Oh my goodness. Yes. Chicken parm is my favorite and this looks too good! Love that it’s made in the slow cooker. Pinned! This looks so good. I seriously could eat the screen right now. Heather — Oh, so fun! Happy happy birthday! wow you do have a lot going on!!! 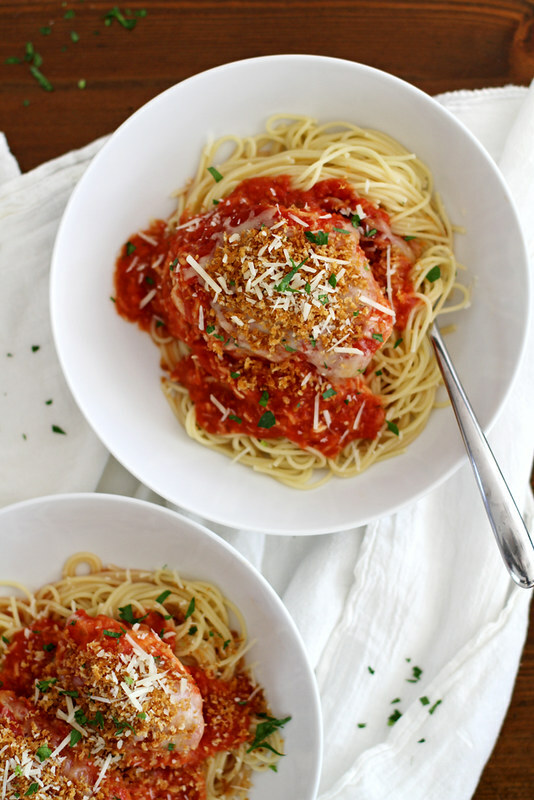 and omigosh this slow cooker chicken parm looks PHENOMENAL-total comfort food!! Sounds like an amazing week coming up! I can’t believe the baby is already turning ONE!! Where has time gone?! Oh man, I hope you enjoy that concert. I have a lot of concerts that are on my bucket list too. Need to pull the trigger on those! Serve me up a bowl of this, please!! All that deliciousness made in the slow cooker? Sign me up! We love chicken parm at my house and this makes it even easier on me; wahoo! This looks so good! Tossing something crunchy onto slow-cooked foods is my new favorite thing…it’s got all the flavor and texture of something whipped up at the last minute without all the work. I’ll have to try this chicken parm soon! Tiffany — Ooooh, that sounds wonderful. I hope it turns out well! One of the easiest and most delicious recipes I have ever made. I added a few things – chopped up onions, chopped green pimento olives, italian spices and some minced garlic. I will be making this a lot – favorite!